I just wanted to mention how nice the new file type icons in 122.395 are. They are very clean looking. I especially like the new XML file icon. hm... I have a feeling that the old icons had little bit more contrast (were little bit bigger?) I am talking about Java/class interface icons. I guess I just have to get used to it.. I agree. The new icons are clear and have a distinctly more modern feel to them. Once thing I noticed - the exception icon has not been updated yet - it still has the old 3d, rounded look. I find the new file icons to be irritating. The lines appear to be very bold. At first I suspected a bug or misconfiguration. I'm OK with how classes look now but for files (.xml, .html, .txt, etc...) the new icons are a step back I fear. I also find the new icons quite bad. First time I saw them, I suspected a bug - either in IntellJ or in my video card driver. And I'm not exagerating. The icons for the class/interface/enum were better before, but they would look fine if you add some gradient. But the icons for xsd, html, txt, folder, package etc. are inacceptable. For exampl the folders look like a rectangle with a big whole in it (because of the white background). Also, there is no more difference between open/closed state for folders/packages. That was useful. Please restore! Also, this is not a ugly vs. pretty problem. It's a usability problem. I have trouble distinguishing the file types (e.g. compare old and new XSD icons). @JetBrains, please confirm: the icons are work in progress, right ? These are not final, right? If you decide to keep the icons as they are now (using build 122.519), I think I'll have to replace them from an older version of IntelliJ. Putting them in icons.jar should do the trick, right? The is no comparison in my opinion. Every icon was better. EDIT: some of the new icons are nice (e.g. refresh VCS changes, Run/Debug icons, etc. It's mainly the filesystem icons (the ones in icons.jar/nodes) the look unfinished. 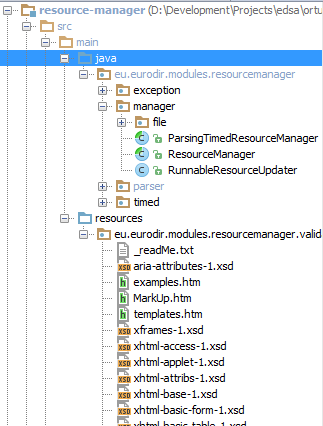 Just confirmed that replacing icons in lib/icons.jar from IntelliJ 11 works fine. Only there is quite some work to do because there is only one icon where there were open/closed icons before. @JetBrains, please restore open/closed state icons and make current icons acceptable. Much cleaner, more meaningful, less distracting. I have to agree in part. While I started this thread by saying I liked the new file type icons (and I still do), I do not care for the new directory/package/module icons. As Cristian mentions, not having a different open (i.e. expanded) versus closed (i.e. 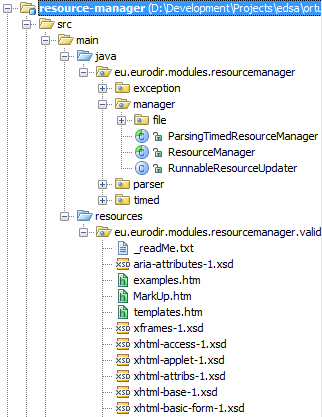 collapsed) directory icons makes visual parsing of the project tree harder. Also, the blue and green coloring of source and test directories is not as contrasting now that the icons have so much white. This makes it harder to find them when scanning down the directory tree. They simply do not "jump out" at you. Like the file type icons, I do like the new toolbar icons. But, I think the directory ones need to go back to the drawing board. When it comes to icons, skins, look & feel, etc., you'll never please everyone. What someone loves, someone else will hate (as this thread is starting to show). At at the end of the day, IMHO, it often does not matter since ultimately this is an IDE and not a painting on a wall to be stared at all day :). But I think in some cases there are real usability issues. And I feel that is the case with the directory icons. I agree 100%. Just compare the two images for readability. The new icons look bold and there is no space between two file icons. Please restore. Come on guys, not all new icons are bad! Like already said, the toolbar icons are ok. In my opinion, it's the filesystem icons that need a lot of work, as they are currently a lot worse than before. Plus open/closed state in a tree is a usability feature that I'd like back. I have to say I think the new icons are a step back. They seem to have less contrast, making it harder to distinguish things at first sight. Especially the "folder"/"package" icon is a strange change: the old one fit in reasonably on the OS I'm using (Windows), while the new one is quite hard to recognize as a folder of any kind. And Apple mice used to not have the option to right click. They finally understood it's a bad idea :). Now, if you really want to make IntelliJ look more native, you can remove the difference on Mac. But Windows has an open/closed state. Though if I had a Mac, I would still like to preserve the open/close state in IntelliJ. The issue of no space between the file icons is not universal. Is there any youtrack issue so we can vote / express our "concerns" ;) ? The new style almost seems inspired by the 'Metro' style from Microsoft. In principle I'm not opposed to the style, but there needs to be a bit more contrast on the file icons to make them jump out more. The directory icons just feel wrong. The color is muddy, the indication of a module feels out of place, and the whole thing feels unbalanced (too heavy on the (top)left). I am not sure there should be an agenda to make IDEA look more 'native' ... something which isn't worthwhile in mho, particularly given the major differences in visual styles across the various. OSs. The time spent trying to do this could, I am sure, be better spent elsewhere. I do think that the comment about the spacing between the file icons needs to be addressed - they give the new scheme an unfinished feel. In particular, I have noticed that the new icon for XML files seems cramped and, crucially, less readable, than the previous one. I do like the new flattened, pastel-toned look but the chars on the icons need to be readable or removed and another identifying cue used. I am not sure there should be an agenda to make IDEA look more 'native' ... something which isn't worthwhile in mho, particularly given the major differences in visual styles across the various OSs. The time spent trying to do this could, I am sure, be better spent elsewhere.